Duke Ellingtonhad a number of great hits in the 1930s, including "Mood Indigo", "It Don't Mean a Thing (If It Ain't Got That Swing)", "Sophisticated Lady", "Solitude", "In a Sentimental Mood", "Caravan", "I Let A Song Go Out Of My Heart". In 1941, he had another great hit with "Take the "A" Train" (written by Billy Strayhorn). Other 1940ss in which he was involved included "Cotton Tail", "Main Stem", "Harlem Airshaft", "Sidewalks of New York (East Side, West Side)", and "Jack the Bear". 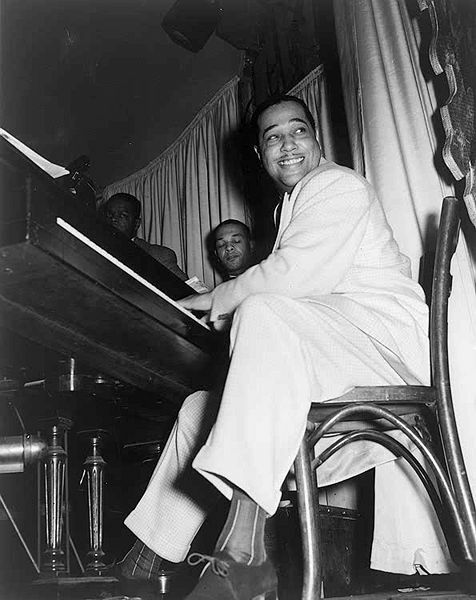 Duke Ellington at the Hurricane Club in New York, May 1943. 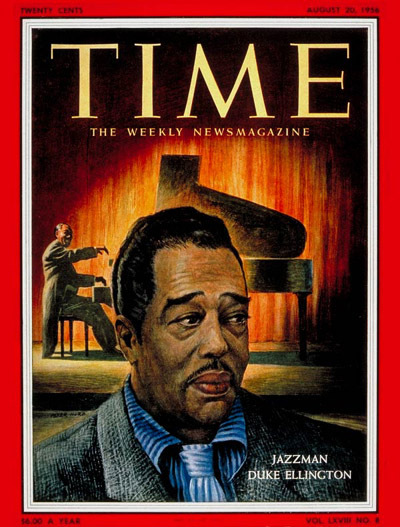 Duke Ellington as featured on the August 20, 1956 cover of Time Magazine. Duke Ellington as portrayed on a United States postage stamp issued in 1986.